Even if you use a heavy bodied acrylic pigment (which I recommend) painting with acrylics is often disappointing if you are used to the thickness of oils. Also as acrylics dry they become thinner dimensionally because much of the mass of the pigment is water. As it evaporates the film shrinks to have less texture. Oil colors dry by oxidation so do not lose mass as they dry. The secret to making acrylics feel like oils as you paint and dry with thick texture is to add a medium. The medium I use in the video is Golden Paint's Extra Thick Gel because of its extremely thick yet creamy texture. In some mixtures to further increase the thickness of the gel, I add chalk. The extra thick gel added a very oil-like feel to the acrylic paint. Plus it didn't take much pigment to tint the gel. Since the gel is much cheaper than most pigments (like Cadmium Red for example) it's a good way to paint thickly yet conserve expensive pigments. Another cool paint from Golden is High Flow Acrylics. I used Raw Umber pigment in my Liquitex Acrylic marker to do the drawing on the canvas. It has an ink-like consistency and in conjunction with the marker is a great addition to any acrylic painter's toolkit. Another really fantastic medium is Liquitex Liquithick. It has an uncanny ability to thicken acrylic paint. You really have to try it to see how effective it is at thickening pigment. I've found a little goes a long way but I still wish they sold it by the gallon. 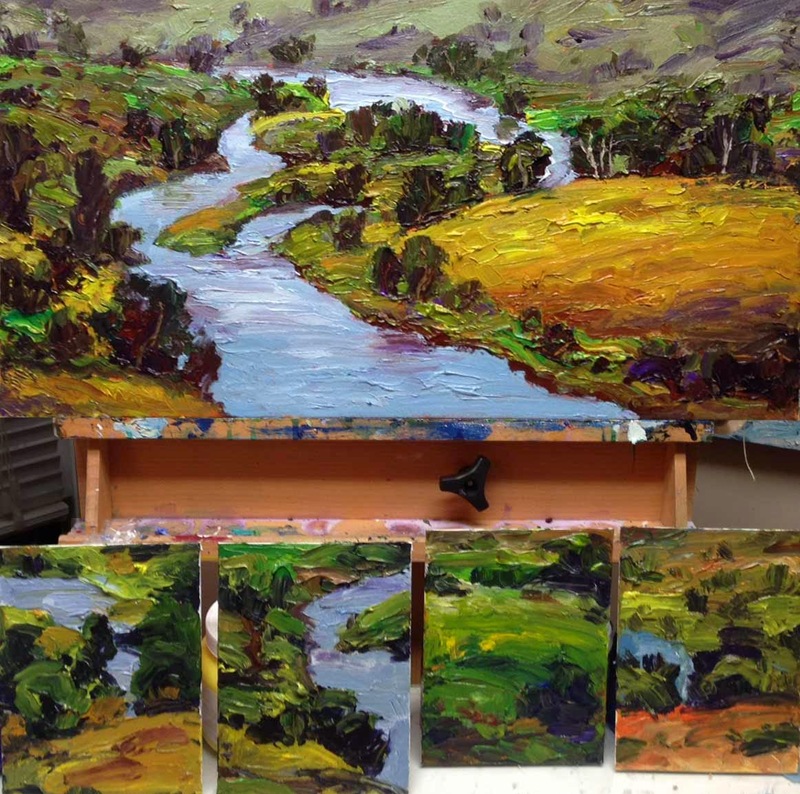 In the photo at the top of the page, you will see four 5" x 7" paintings I did as preliminary sketches previous to the larger painting. In a future blog, I will outline how I used these roughs in a deliberate practice routine. Hello Brad, I have just spent an enjoyable half hour going over a few of your posts. Your paintings are wonderful. I love the colors and active surface. I admire all the information you provide to help us fellow artists along the path of our passion for painting. Glad you are enjoying the blog Julie. Many thanks for the kind words. I hope to hear from you again soon. Just painted a small work using oil, using knife. Huge difference from Acrylic. I simply love the way oil paint feels, its consistency is something amazing. And I was having this exact question. thanks for sharing this approach. I am going to give it a try. Will using the gel+chalk get acrylics closer to the way oil feels? I liked the 'drag' it had on the knife as I kept mixing. Hi, Ganapathy. Nothing really feels quite like a really high quality oil paint but using the gel and chalk is close. I tend to use acrylics when I need a very highly textured surface and I want to rework it a lot. Otherwise I use oils. Sorry for the late reply. I have spent an amazing time today catching up with all posts, after a long time, putting aside my constraints. To be honest, I am going to get out of my creative block after this! Thank you!